Remarks on the comparative merits of cast metal and malleable iron rail-ways; and an account of the Stockton and Darlington rail-way. [With] ADAMSON, J. Sketches of our information as to rail-roads. 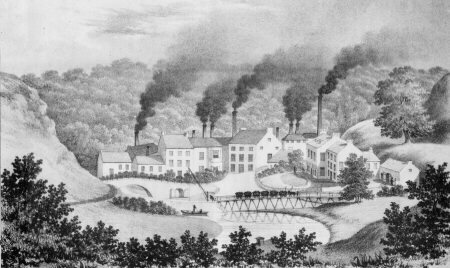 In 1820 John Birkinshaw, Manager of the Bedlington Iron Works in Co. Durham, took out a patent for rolling wrought-iron rails in 15ft lengths. This was a development of immense significance for the infant railway system because wrought iron was able to withstand the moving load of a locomotive and train unlike cast iron, which was brittle and fractured easily. The first major use of the Birkinshaw rail was on the Stockton & Darlington, opened 1825. The present work, in three parts, was written and compiled by Michael Longridge, owner of the Bedlington Works. The first part had originally appeared in three editions from 1821 under the title, " Specification of John Birkinshaw's patent, for an improvement in the construction of malleable iron rails ". The second part contains the accounts of the opening of the S&DR taken from the Newcastle Courant and from the Caledonian Mercury , then promoting an Edinburgh-Glasgow railway link, together with "Extracts from the report of the Committee to the Proprietors of the Stockton & Darlington Rail-way" for July 1827. The final part consists of Adamson's "Sketches of our information as to rail-roads" with its early attempt to investigate the characteristics of a locomotive and train on the level and on inclines. Although much of the material had already been separately published, the present collected edition is greatly enhanced by the presence of three exceptionlly fine lithographs. Of these, one is the famous "View of the opening of the Stockton and Darlington Rail Road", showing the Brusselton inclined plane, the train of waggons crossing the Skerne bridge and its splendid train of carriages, while the other two are views of the Bedlington Iron Works. 8vo. 22 + 39 + (1) + 26pp, 3 folding litho plates (1 very large). Quarter calf. Skempton No. 860. Ottley No. 313.